Politics really does make strange bedfellows. With the LEFT, Democrats and the MSM constantly and unfairly attacking President Donald Trump, it is former Democrat President Jimmy Carter who came to his defense. President Carter said that, “I think the media have been harder on Trump than any other president certainly that I’ve known about. Carter went on to say, “I think they feel free to claim that Trump is mentally deranged and everything else without hesitation.” Carter may have been one of the worst presidents in modern times; however, no one can dispute he is not a good man. Kudos to Jimmy Carter for trying to smooth the divide and stating the obvious situation with the bias media. Former President Jimmy Carter in a new interview defended President Trump for facing a harsher media environment than his predecessors. “I think the media have been harder on Trump than any other president certainly that I’ve known about,” Carter told The New York Times in an interview published Saturday. Carter pointed to the reports that question Trump’s mental stability as a sign the press is going too far in scrutinizing him. “I think they feel free to claim that Trump is mentally deranged and everything else without hesitation,” Carter continued. Lawmakers and critics alike have also repeatedly questioned Trump’s fitness for office. Jimmy Carter, the former President of the United States, held a press conference yesterday and discussed his bout with cancer, Carter stated, that along with having a cancerous tumor on his liver that has since been operated on, doctors had also found four small spots of melanoma on his brain. The former 90 year old president further went on to detail how the cancer was discovered and his upcoming treatments. Jimmy Carter spoke plainly when he said Thursday that doctors had found “four spots of melanoma” on his brain. The 90-year-old former president was relaxed and matter-of-fact as he talked about the uncertainty he faces. “I’m perfectly at ease with whatever comes,” he said. Flanked by family members and friends at a news conference at the Carter Center in Atlanta, he detailed the treatments that he has already begun and will continue in coming weeks, including radiation and the IV infusions of a new type of anti-cancer drug that tries to harness the body’s immune system to fight the disease. All politics aside because trust me, Jimmy Carter was the second worst president in modern times, we with him our prayers and a speedy recovery. 90 year old former President of the United States Jimmy Carter has announced that he has cancer. 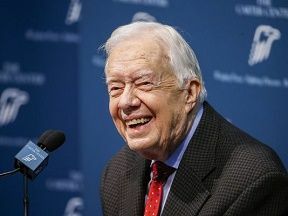 According to a statement from The Carter Center the disease was discovered during recent liver surgery to remove “a small mass” and that the cancer “is now in other parts of my body.” The former 39th president will be undergoing treatment at Emory Healthcare in Atlanta. 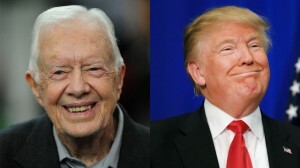 Although, I may disagree 100% with Carter’s politics and would like to forget his disastrous presidency from 1977 to 1981 making him the second worst president in history, however, I commend him for his post presidential work with Habitat for Humanity and wish he well and a fast recovery. Cancer does not discriminate between political ideology, it is a hideous disease that all of us have in one way or another been personally touched by. Get well Mr. President. Good wishes poured in on social media after Carter’s announcement, while President Barack Obama said he and first lady Michelle Obama wish Carter a fast and full recovery. “Jimmy, you’re as resilient as they come, and along with the rest of America, we are rooting for you,” Obama said in a statement. Carter was the nation’s 39th president, defeating Gerald Ford in 1976 with a pledge to always be honest. JIMMY CARTER SAYS OBAMA HAS HAD MINIMAL SUCCESSES ON THE WORLD STAGE … I GUESS THAT IS A GOOD THING FOR THE WORLD. After proclaiming John Kerry “one of the best secretaries of state we’ve ever had,” Carter dumped cold water on Obama’s record abroad. “I would say the U.S.’s influence and prestige and respect in the world is probably lower than it was six or seven years ago,” Carter said.